We had to be away from our beds by 10am but could carry on using the Albergue as a base. Brilliant. By 10am we were outside in the rear garden packing our bikes and sliding them into the CTC plastic bags ready for the flight. As the bags were see-through I’d already printed the return flight details onto an A4 sheet of paper and I stuck this to the front wheel just in case any of the labels came off in transit. One pannier with clothing, tools and anything unable to carry on the flight was attached to the frame and the whole thing bungee’d together. Remaining pannier with a shoulder strap to take on the aircraft. Sorted. Time to explore. 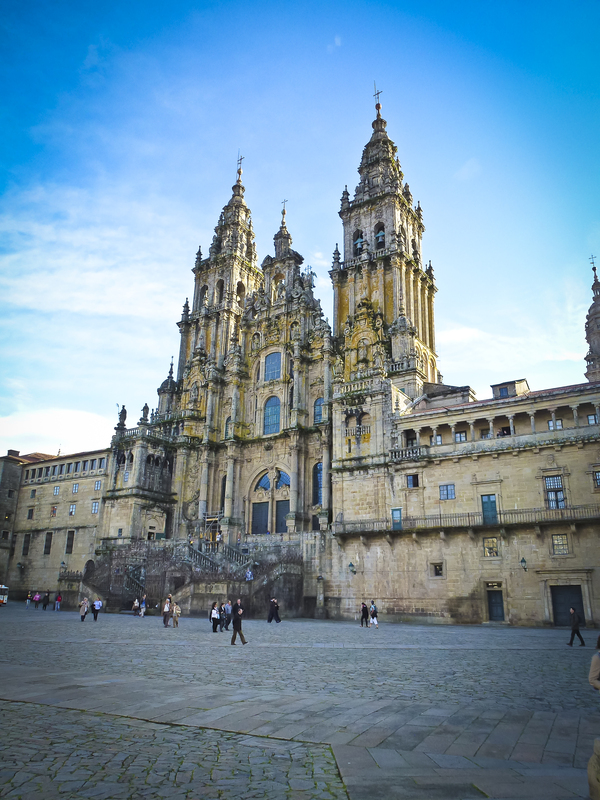 The first thing we did was go back to the cathedral and walk around the square (Praza do Inmaculado). I bored Glen with stories of the last time I was here and we went up the steps to the main gate. It was nice to see the trees growing from the walls of the cathedral high above us have come on some since my last visit. Entering the cathedral I just made sure I saw everything from every angle. Not sure if I’d ever come back again and this time I knew a lot more than last. The botafumeiro hung above the altar and I made sure I took photographs of the ropes at the anchor point. We visited the tomb of St James and climbed the steps to rub the neck of the statue. I tried to find out the times of mass but could only find the opening times of the cathedral. We walked out into the sunshine and wandered towards the tourist office to see if they knew more about mass, they said that mass would be at 12 but they don’t perform the pilgrims mass and swing the botafumeiro unless it’s a special occasion or someone (more important than us, she did stress that!) requests it! We were then told that an indication of pilgrims mass would be the botafumeiro hung above the altar. Ok, we hot footed back. Took a good seat and witnessed the whole shebang. They even mentioned the three pilgrims from St Jean Pied du Port amongst the list of pilgrims. I looked for the third punching the air but didn’t see anyone. I filmed as best I could the swinging botafumeiro but my battery ran out at the start! Quick change and I got the rest. I have to say the other YouTube videos I’ve seen of this the sound is pretty awful. Doesn’t truly put you there. The organ bass is booming and the nun singing throughout the start of mass is actually pretty amazing. As I write I know that I cannot do this moment justice. We’d travelled across the country under our own steam to be part of this, this moment was waiting our arrival and even then not all pilgrims get to see it. Everyone there had slid their backpacks under the benches and the fact that it was for pilgrims made us feel like we absolutely should be there, regardless of religion. Didn’t understand a word of it though…..
Leaving the Cathedral we wandered around tourist shops until they closed and then sat outside a bar drinking coffee, just people watching. At some point we crammed in a craved Burger King meal and then we dragged our bike packs to the nearby bus stop at Praza de Galacia for the 3 Euro trip to the airport. We weren’t due to fly until 10am the next day but sleeping in the Albergue, waking mega early and dragging the bikes to the bus stop to get to the airport for 8am didn’t sound like fun, especially when sleeping on the airport benches wouldn’t have been the most un-comfy night of the whole week! On arrival I was surprised to see the packing guidance for bikes painted on the wall. The dimensions for a cycle now could be as big as 2m x 90cm x 90cm. I suppose that’s tandem plus double child trailer. Plus they had a load of bike tools chained up nearby. In case you managed the whole trip without them. 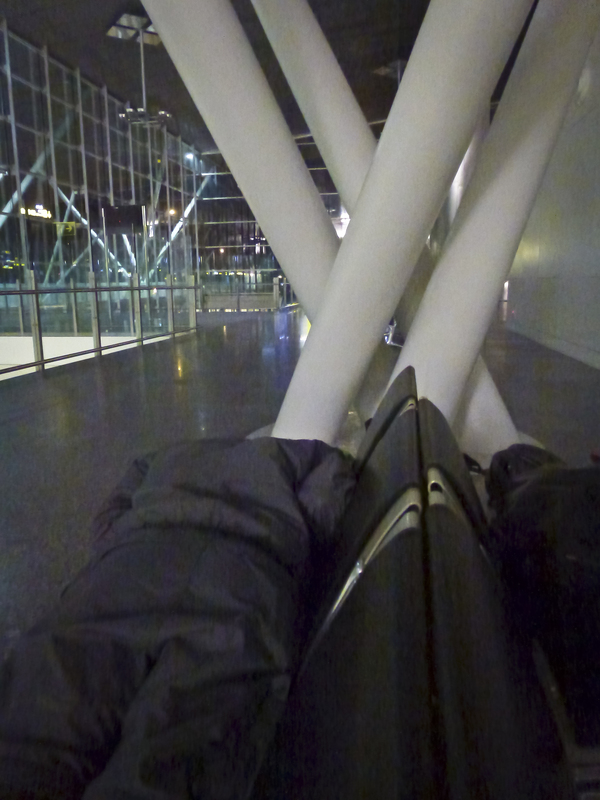 I thought about spending the night loosening all the wheels on the luggage trolleys but I caught up on the rest of the blog and uploaded it instead. So that’s it. Eventually we boarded the plane and found ourselves in the safest seats according to that programme on channel 4. Glen slept and I couldn’t afford a drink with my leftover change. We went into the church and looked round st james…. a very pretty church.. we saw the burial place of st james and just took it in… we never expected to see what we saw at midday..
We did the tourism bit bought presents take back home and chilled till time to head to the airport… we gor to the airport at 1800 hours… slept there that night…. plane the next day and back to Stansted. .. Aim for it and you can achiece anything…..